(TibetanReview.net, Jun06, 2016) – Although a bit down compared to last year, the world’s largest yearly protest rally still drew 125,000 as the people of Hong Kong commemorated on Jun 4 the 1989 Tiananmen Square bloodbath in Beijing in which the Chinese People’s Liberation Army killed possibly thousands of citizens protesting for democracy and end to official corruption. The special administrative region of Hong Kong is the only territory in the People’s Republic of China to see a major commemoration to mark the occasion. In mainland China, the government reminds the people of the occasion more by default than design, by heavily strengthening security measures, mopping up democracy activists and imposing censorship on all discussions about this shameful chapter in the history of the communist Party of China. As in past years, the candlelit vigil in Hong Kong took place on the Victoria Park. 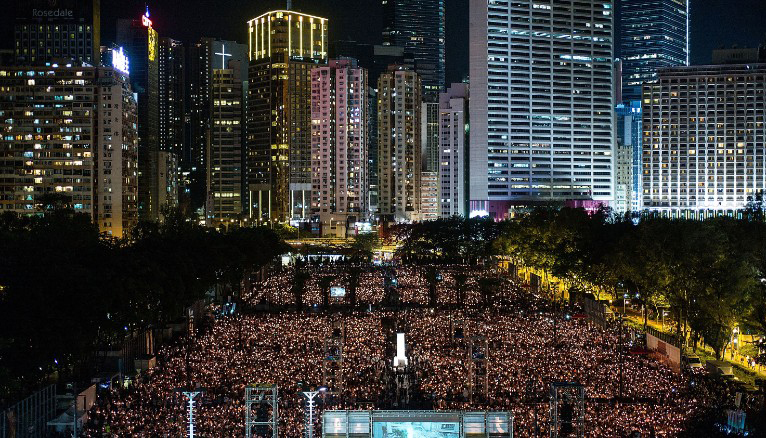 The park became a sea of candles as residents paid tribute to the Tiananmen victims. Organisers estimated that 125,000 had attended, down from last year’s 135,000, reported the AFP Jun 4. They sang protest songs and chanted “Fight to the end” as footage of the bloody crackdown was shown on big screens, the report added. Despite lower numbers than last year, organiser Albert Ho was cited as saying there was no such regular protest gathering “in the history of mankind”. Scuffle was reported to have broken out after the vigil as around 300 protesters marched to China’s Hong Kong liaison office, which represent the mainland in the semi-autonomous city. The report added that the confrontation happened when police tried to prevent the group walking in the road, but that the march resumed peacefully. The marchers were reported to have thrown a placard demanding that China free all prisoners of conscience over the wall of the liaison office compound and to have burned paper effigies of former mainland officials blamed for the Tiananmen crackdown. Young activists from the new “localist” movement boycotted this year’s vigil, saying Hong Kong should push for its own autonomy, even independence, rather than the democratisation of the mainland, which was part of the vigil’s main message. Localism grew out of the failure of the 2014 student-led pro-democracy rallies to gain concessions from China on political reform for Hong Kong, and a growing number of student groups were now boycotting the vigil to hold alternative gatherings, the report noted. They see the 1989 event’s message as increasingly irrelevant.